CODE, the Center for Orbit Determination in Europe, is a joint venture of the Astronomical Institute of the University of Bern (AIUB, Bern, Switzerland), the Swiss Federal Office of Topography (swisstopo, Wabern, Switzerland), the Federal Agency for Cartography and Geodesy (BKG, Frankfurt am Main, Germany), and the Institut für Astronomische und Physikalische Geodäsie of the Technische Universität München (IAPG/TUM, Munich, Germany). CODE has been one of the global analysis centers of the IGS (International GNSS Service, a voluntary federation of more than 200 worldwide agencies that pool resources and permanent GPS and GLONASS station data to generate precise GPS and GLONASS products) since the start of IGS test campaign operations on June 21, 1992. All operational computations are performed at the AIUB using the development version of the Bernese Software. Since May 2003, CODE has been analyzing GNSS (GPS and GLONASS) data in a combined analysis to achieve the best possible consistency of the GPS and GLONASS orbit products. This strategy is not only applied to the CODE contributions to the IGS final products, but also to its rapid and ultra-rapid products. In the past, interpreting GNSS-derived long time series was difficult due to inconsistencies caused by changes in the processing strategies by, e.g., model updates and/or a more sophisticated parameterization. This problem can only be overcome by a complete and homogeneous reprocessing starting with the original (RINEX) observation data and using of course the latest available models and analysis strategies. In February 2008, the Analysis Centers of the IGS started the process of reanalyzing the full history of GPS data collected by the global network of the IGS since 1994 in a fully consistent way using the latest models and methodology. For the CODE contribution to the IGS reprocessing, all relevant parameters of a global GPS solution were estimated based on 15 years of GPS observation data from 244 different tracking stations. 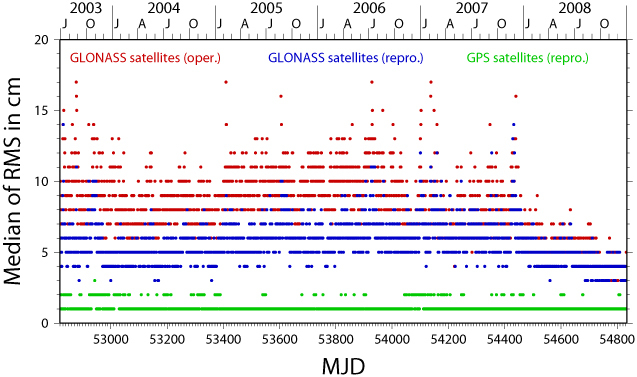 Figure 2: total number of GPS satellites considered in the first IGS reprocessing campaign computed at CODE. The quality and homogeneity of all types of parameters estimated within the reprocessing campaign could be significantly improved compared to the official solutions, particularly in the early years. In addition to the GPS-only contribution to the IGS reprocessing, a GLONASS extension of the reprocessing was performed to provide fully consistent and also reprocessed GLONASS orbits for the time interval between May 2003 and December 2008 to the users. Figure 3: Median of the RMS for the fit of a three-day arc through the daily independent orbit solutions for the GLONASS satellites obtained in the CODE reprocessing (blue) and the operational CODE final solutions (red). For comparison the analogue values for the GPS satellites from the operational solution are added (green). The time series of combined GPS/GLONASS solutions were used as the basis to update the antenna phase center model. With a limited set of GLONASS calibrations, it is possible to assess the impact of GNSS-specific receiver antenna corrections that have been ignored within the IGS so far. The updated GLONASS antenna phase center model helps to improve the orbit quality. GLONASS-only rapid-static or kinematic solutions benefit mostly from the updated satellite antenna corrections and the reference frame of combined GPS/GLONASS solutions will not be degraded. The new coefficients will be provided as a contribution to the next generation of standard IGS antenna phase center corrections. The reprocessing activities will be continued using the series of homogeneously preprocessed observation files for specific studies. In the frame of a DFG/SNF (the German and Swiss science foundations) project the reprocessing has been extended with SLR (Satellite Laser Ranging) measurements (see Combining SLR and GNSS measurements). This project, a collaboration with research groups from the Universities of Technology in Dresden and Munich (TUD and TUM, both Germany) and ETHZ (Swiss Federal Institute of Technology, Zurich, Switzerland), has combined reprocessed GNSS (including both GPS and GLONASS) and SLR observations.